The World Bank should maintain multi-dimensional engagement with China, sharing its expertise to help Beijing reform and open up its economy and develop new multilateral institutions, its former head said. Robert Zoellick stressed that middle-income countries such as China mustn’t be left out of the World Bank’s system, but should become bigger contributors to it. He made the remarks at a roundtable discussion titled "World Bank Transition: What Could Be Done?” jointly held by Caixin and the Peterson Institute for International Economics, a U.S. think tank, on Wednesday in Washington, D.C.
Zoellick was president of the World Bank Group from 2007 to 2012 and U.S. trade representative from 2001 to 2005 under President George W. Bush. He is now a senior fellow at the Belfer Center for Science and International Affairs at Harvard University's Kennedy School of Government. Zoellick comments mirror those of new World Bank President David Malpass, who lauded the organization’s “constructive” and “evolving” relationship with China at a press conference a day later in Washington D.C. Malpass started his new job earlier this month. Malpass said China is naturally evolving from being a major borrower from the bank to becoming a smaller borrower, while becoming a major donor and shareholder at the same time. 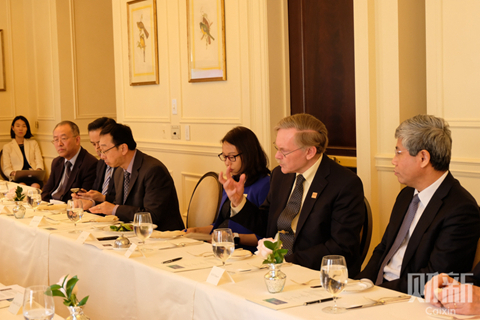 Zoellick’s talk focused on how the World Bank can share its experience and expertise with China on reform of state-owned enterprises, the opening up of the services sector, as well as its development of new multilateral institutions, such as the Asia Infrastructure Investment Bank. Reform of state-owned enterprises is critical to improving the nation’s productivity to enhance the development of the Chinese economy, Zoellick said. Beijing is also seeking to boost the services sector, as the economy shifts from being based on exports and investments to domestic-demand led growth. In addition, he advised China to open up its services sector to increase domestic demand and boost future growth. By allowing foreign firms greater access to its large domestic market, China could create win-win outcomes in current and future trade negotiations. Zoellick also defended continued World Bank lending to China in the face of growing friction between the United States and China. The World Bank, of which the U.S. is the largest stakeholder, still offers loans to China and this has irked some U.S. congressmen. He noted that China has become a contributor to the International Development Association under the World Bank that targets programs helping the world’s poorest countries. Zoellick also urged the new World Bank leadership to encourage the participation of all economies and not leave some out of the system. There have been suggestions that given the scarcity of economic resources, the World Bank and other regional development banks should focus on helping poor countries rather than middle-income nations like China. All countries can contribute to solving global development issues, such as the trade financing system, responses to climate change and improvements in local security.